Kashima Antlers has not submitted any formation. 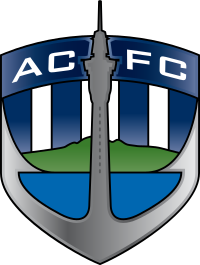 Auckland City FC has not submitted any formation. Joseph Savea shoots... but the goalkeeper dives to get the ball. Hotaru Momochi passes the ball towards the centre... but the opponent catches it. GOAL - what a trick by James Noble! James Noble steals his opponent's ball in a tackling. Freistoß für Auckland City FC! Frank King schießt, aber zu ungenau. Hachirou Unohana is shown the yellow card. Hachirou Unohana in a tackling... and looses it! Jiro Hino tries to pass the ball to the strikers... but misses! Peter Begum tries to pass the ball to the strikers... but misses! Nori Takahara passes the ball... and the ball is out. Frank King passes the ball towards the centre... but the opponent catches it. Yukio Shiba passes the ball... and the ball is out. Cross by Joseph Savea... into the clouds! Joseph Savea steals his opponent's ball in a tackling. Yoshio Hesebe has the ball and sees his opponent in front of him... and looses the tackling. Yoshio Hesebe in a tackling... and wins it! Yoshio Hesebe tries to pass the ball to the strikers... but misses! Yoshio Hesebe has the ball and sees his opponent in front of him... but he can win the tackling. Cole Clash runs towards his opponent and wins the tackling! Cole Clash shoots... but the goalkeeper can turn the ball around the goalpost. Jiro Hino passes the ball... and the ball is out. Cole Clash has the ball and sees his opponent in front of him... and looses the tackling. Akira Yada shoots... but missed. Cole Clash passes the ball... and the ball is out. Iori Miura passes the ball... and the ball is out. Cross by Cole Clash... into the clouds! James Noble has the chance to shoot... and cannot even target the goal. Hotaru Momochi is shown the yellow card. James Noble runs towards his opponent and wins the tackling! James Noble shoots... but the goalkeeper can turn the ball around the goalpost. Shuichi Kuugo tries to pass the ball to the strikers... but misses! Joseph Savea has the ball and sees his opponent in front of him... but he can win the tackling. Frank King shoots towards the goal... but into the arms of the goalkeeper! Shuichi Kuugo passes the ball towards the centre... but the opponent catches it. GOAL - what a trick by Joseph Savea! Hotaru Momochi passes the ball... and the ball is out. James Noble runs towards Arata Yamada... and looses the ball. Peter Begum shoots... into the sky. Header by Yukio Shiba..... and the ball is in the net! Freistoß für Kashima Antlers! Nori Takahara schießt, aber zu ungenau. Peter Begum hits his opponent and gets the red card for that. Peter Begum lets taken away the ball. Cole Clash runs towards Jiro Hino... and looses the ball. Cole Clash steals his opponent's ball in a tackling. Peter Begum passes the ball... and the ball is out. Nori Takahara tries to pass the ball to the strikers... but misses! Frank King passes the ball... and the ball is out. Nori Takahara passes the ball towards the centre... but the opponent catches it. Joseph Savea shoots... but the goalkeeper can turn the ball around the goalpost. Joseph Savea runs towards his opponent and wins the tackling! Joseph Savea has the chance to shoot... and cannot even target the goal. Cross by Hachirou Unohana... into the clouds! Frank King tries to pass the ball to the strikers... but misses! Joseph Savea lets taken away the ball. Hotaru Momochi tries to pass the ball to the strikers... but misses! James Noble tries to pass the ball to the strikers... but misses! Iori Miura lets taken away the ball. Peter Begum passes the ball towards the centre... but the opponent catches it. Cole Clash tries to pass the ball to the strikers... but misses! Akira Yada runs towards Chris Palmer... and looses the ball. Chris Palmer passes the ball towards the centre... but the opponent catches it. Nori Takahara lets taken away the ball. Scott Roberts passes the ball towards the centre... but the opponent catches it.